I've always liked windows and doorways, the portal between the interior and the outside worlds. And I like drawing with pencil. And I like plants. This drawing has all 3 elements! Wow. 8 x 7 inches, pencil on paper. This simple drawing is really wonderful. It reminds me of the "gesture" drawings we did at Beloit. There is a lot of joy an energy in this image. It's more effective than some of your more serious, studious work. I don't think I've ever this drawing before. I'd like to seem more. They're great. I really like what you can do with pencil, or prisma colors and even charcoal. When I saw this drawing I immediately thought of the Lovejoy apartment, the backporch entrance with the great view of the NW Hills, and the time spent cutting your drawing mats back in 1989. You had limited supplies and no wastage was acceptable. 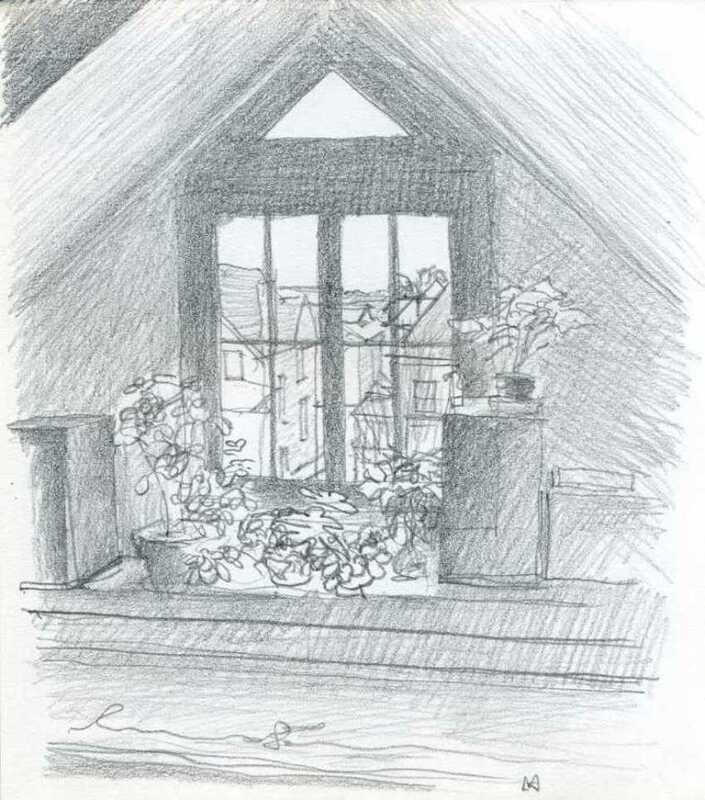 Any drawings of the pavement from this window? I can see you're not going to be satisfied until you get more pavement. OK.